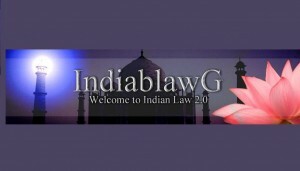 Expert know-how and updates on Indian law are now available at http://www.Indiablawg.com. A great contact from our own Linkedin, Manish Dhingra owns a commercial Indian Law firm, Dhingra and Singh and is a Foreign Legal Consultant at Software Tactics, Inc. in Chicago in the US. View Manish’s profile on Linkedin here. It is hoped that the Indiablawg site and Indiablawg Twitter account are able to contribute towards the laws of India for the benefit of both businesses and lawyers from India and the rest of the world. Keep up to speed on all other relevant legal updates from WardblawG’s twitter account.